At least three species of yellow jackets are found in the Pacific Northwest (V. vulgaris, V. germanica, and V. pensylvanica). Colonies begin with a single fertile queen establishing her nest in an aerial or underground location (depending on species) in the spring; laying eggs and nurturing the larva until they pupate. Once worker bees begin to emerge some 30 or more days later they take over the growth of the colony and nest construction. Population numbers are generally at their greatest from August to October, when nest populations can easily exceed 1,000. New males and queens will leave the nest in the late fall, where they will mate. Inseminated queens hibernate and survive the winter in a solitary location; the remainder of the colony dies out. Nests are generally not reused from year to year. Control measures: If active yellow jacket nests are found in or around a structure, eradication may require the services of a pest control professional. Yellow jackets can sting repetitively and some people can be hypersensitive to their stings. Leupitz Pest Control can provide the services required to aid in yellow jacket control. Easily identified by their black and white appearance (with a mostly white face) and ball-shaped aerial nests, bald-faced hornets are common throughout the Pacific Northwest. Generally their nests are found attached to tree branches, though occasionally they may construct nests under roof eaves or structure overhangs. Their life cycle is similar to that of yellow jackets. Nest populations, however, tend to be smaller than yellow jacket colonies. 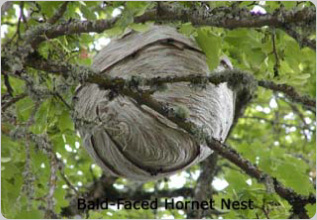 Control measures: If active bald-faced hornet nests are found in or around the structure, eradication methods are similar to that of yellow jackets. Leupitz Pest Control can provide the services required to aid in bald-faced hornet control. Several species of bumblebees are found in the Pacific Northwest. Generally the species found are either black with yellow or black with yellow and brown or orange. Bumblebees are easily distinguished by their overall fuzzy appearance, including their abdomen. Typically they will nest in the ground or in grass clumps. They have been found to nest in compost piles or in structures such as in subfloor insulation. They are considered a beneficial insect due to their contribution to pollination. Nest sizes generally are 50-400 in size, as opposed to honeybee colonies that can number into the thousands. While typically not aggressive, bumblebees can sting repetitively when provoked. Control measures: As bumblebees are beneficial pollinators, nest eradication should only be performed when an immediate threat to human health and safety exists. Nest eradication can be performed by direct injection of the nest with a properly labeled over-the-counter insecticide. Do not plug the entrance to the nest closed after treatment for at least 48 hours. Structure infestations, or people allergic to bee stings, should enlist the services of a licensed pest control operator to eradicate a problem nest. The European honeybee found throughout the Northwest is a beneficial insect and highly important to agriculture. Generally the only two scenarios where honeybees can become problematic are when a swarm lands on one’s property or if a swarm invades a structure. If a swarm happens upon a tree or bush adjacent to a structure, the best thing to do is leave it alone. Generally, such swarms are in transit and will disperse within 24 hours. If a colony becomes established in a structure, such as a wall void or enclosed roof eave, removal of the nest can become much more complicated. This is especially true when a colony establishes itself near people who are physically hypersensitive to bee stings. In recent years, however, populations of European honeybees throughout the U.S. have dropped dramatically. A decade ago, much blame was place on a phenomenon called Colony Collapse Disorder (CCD), where substantial portions worker bee populations would disappear from colonies. According to the U.S. Environmental Protection Agency, losses due to CCD, while still occurring, have decreased on a percentage basis. Scientific research is ongoing as to what factors may be contributing to this disorder. Other factors (varroa mites, use and misuse of pesticides in crop and ornamental settings, habitat change, and current bee management practices) may also play a role in pollinator population decline. The loss of honeybee populations poses a potential threat to the domestic food supply due to the honeybee’s importance in pollination. In the interest of protecting the environmental and agricultural needs of our area, Leupitz Pest Control does not provide control services for these beneficial insects. We can, however, oftentimes recommend professional beekeepers to come out to the site and ascertain the best way of nest removal. The much-publicized ‘Africanized’ (so-called "killer") honeybees have to date not be found in the Pacific Northwest.